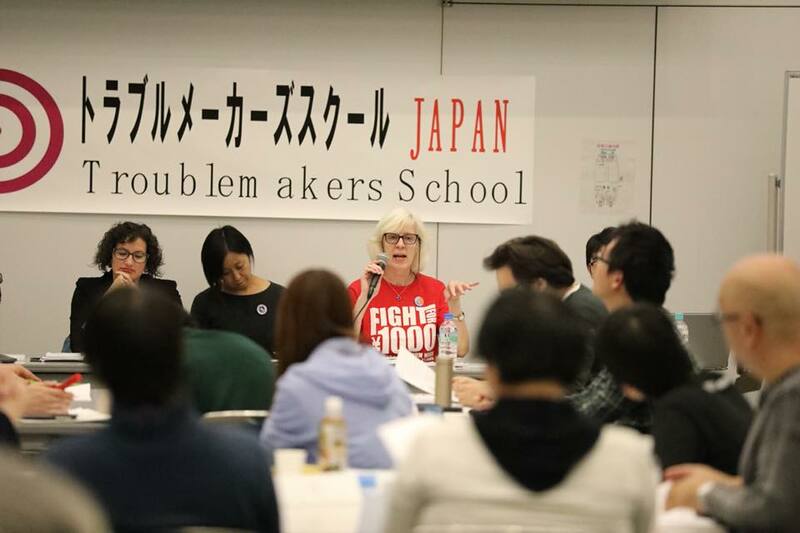 Tokyo and Osaka saw the first Troublemakers Schools outside North America in November, organized by an energetic local committee. Leah Fried and I came from the U.S. to lead workshops with postal workers, nurses, university workers, truckers, public employees, and meatpacking workers, alongside members of the Fight for $15, community unions, a women’s union, a youth union, and a “precarious” workers union (part-timers and temps). Just as in the U.S., Japanese employers have endured a decades-long attack, and wages have been stagnant. About a third of the workforce is part-time, and part-timers are disproportionately women. Union density is slipping, though it’s still at 17 percent. The room gasped when we admitted that ours was 10.7. We found that some common practices in the U.S. didn’t resonate. It’s not unusual for small and scrappy unions to leaflet outside a defiant employer. 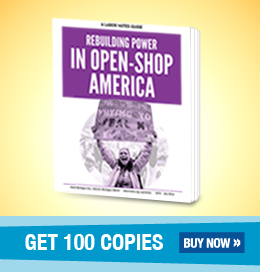 One union gathered at an owner’s house late at night and harangued him through a bullhorn (they’re now running the store as a cooperative). But most people said they didn’t think they could get co-workers to wear a button at work. In one small group in Osaka, participants plotted an ideal campaign against understaffing in a health center. They would start with a survey of other health centers, to collect data to make their case. They’d call a workplace meeting to make sure everyone agreed with the demands. They’d meet with the CEO, and when that failed, with patient organizations. They would leaflet and petition in the neighborhood served by the center and ask neighbors to demonstrate for safer staffing. And after their win, they would share what they’d done with health centers in other cities. It sounded like something that would come out of a Troublemakers School in Minneapolis or Dallas. We expect a big Japanese delegation at the April 2018 Labor Notes Conference in Chicago. And we hope they’ll bring copies of the Japanese translation of the Labor Notes book Secrets of a Successful Organizer, set to be released soon. Undaunted by the fact that the book can’t be published in their country nor posted on the Internet there, Chinese worker activists have translated Secrets of a Successful Organizer into Chinese. The book will be distributed hand to hand, on paper and PDF; a few small reading groups are already working through it. And worker activists in Taiwan and Hong Kong, where it’s possible to publish it as a real book, are considering doing so. German union activists are building their own Labor Notes-style organization. German labor activists started their own Labor Notes-style organization in 2014. They call it OKG, which (in German) stands for Organizing, Fighting, Winning. “We agreed that there are many good projects in Germany, but nothing like Labor Notes,” said Thomas Goes, a founder and a former Labor Notes intern, in an interview with the German magazine Express. OKG held its first conference October 28-29, with 70 union members and staffers attending, including workers from construction, steel, and food service. “We wanted to create a space for something which we haven’t had in Germany—a space first and foremost for workers,” said Goes, contrasting it with other conferences dominated by union officials or political activists. The conference centered on sharing workers’ struggles to fight union-busting, build a more active works council, and challenge the co-management mentality in their unions. 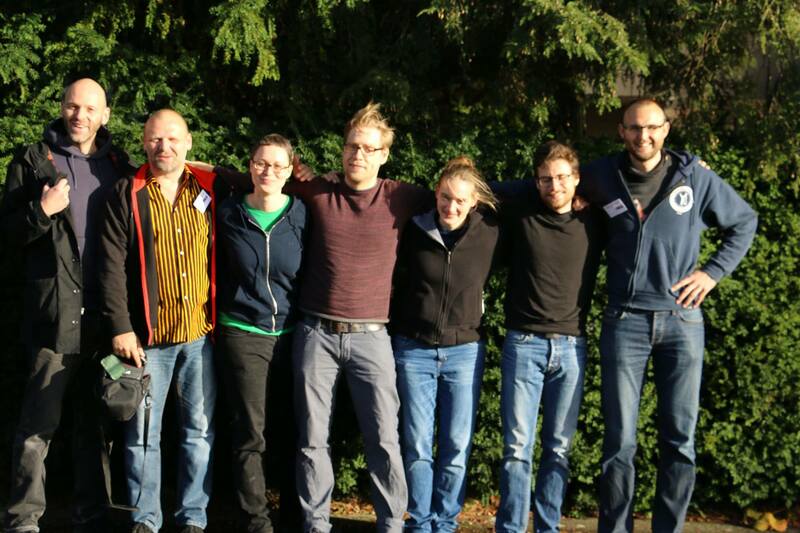 Two workshops were taken from Secrets of a Successful Organizer, which OKG has translated into German. A panel featured participants from two prominent ongoing struggles: a contract fight at Charité hospital in Berlin and the effort to improve conditions at Amazon. Outside the U.S., Germany is the online retailer’s largest market. For info on bringing Labor Notes to your union or area, visit our Training page. To help support efforts like the ones above, make a tax-deductible contribution today. And to meet members of the Troublemakers Union from all over the world, register for the 2018 Labor Notes Conference, April 6-8 in Chicago.